Starring: Amy Adams, Jeremy Renner, Forest Whitaker, and more. As an alien spacecraft makes first contact with Earth in twelve different locations. Teams all over the world begin working on finding out what prompted the visit and why. In Montana, Louise Banks (Amy Adams) is recruited to decipher the alien language being collected in frequent meetings with this alien life-form when visiting them on their spacecraft. Alongside a physicist, Ian Donnelly (Jeremy Renner), and a team of brilliant minds, they begin to understand the information gathered during said meetings and ultimately find out if this contact can result in something positive for mankind or certain doom. ‘Arrival’ was truly a wild ride. Honestly, I feel this will be a film to be remembered within the genre for years to come. 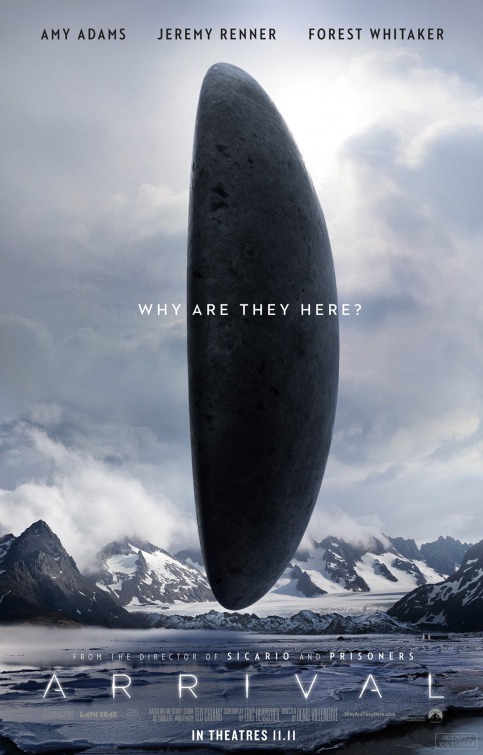 While some fans of the genre may feel that Sci-Fi films should be filled with alien blasting action or deep adventure, ‘Arrival’ thrives off of the desire to understand and an all-around curiosity for not only what an alien species could do if they were to interact with human civilization but what human nature could do given if this situation were to happen. As an audience member, I found myself curious as to what was going to happen next within the story from start to finish. Although moving at what could be seen as a slow pace, it had this creative “edge-of-your-seat” feel to it as I anticipated anything to happen at any moment. If you are to view this film, I will warn you, curiosity and confusion can/will occur, but it only compliments the creativity within this film… Production wise, director Denis Villeneuve executes with suave perfection. With every passing moment, you can feel his influence in what he wanted each actor and actress to express with every movement and reaction. From as little as a simple gesture to the biggest line execution. A special nod goes to Bradford Young for the cinematography within this piece. There were scenes and moments within this films that looked utterly beautiful that blended so well with the vibe of the film. Leaving myself, personally, with stills and movie moments I will never forget as they were so interesting and creative to watch unfold. With the Sci-Fi Drama ‘Arrival’, expect curiosity to take over. It is a story to remember and debate/discuss with your friends for hours on end. A strong recommendation here from Oberrated and yet another worthy Oscar nomination. Posted in 2016 Movies, Movie Review, The Oscars.Tagged Amy Adams, Arrival, Denis Villeneuve, Forest Whitaker, Jeremy Renner.